A wrong turn down a high clearance road or a brave foray into parts unknown can often reward with a stunning grove of aspen or rocky outcrop overlooking a canyon without another camper in site. The joy of discovery is part of the magic of the super-secret campsite. 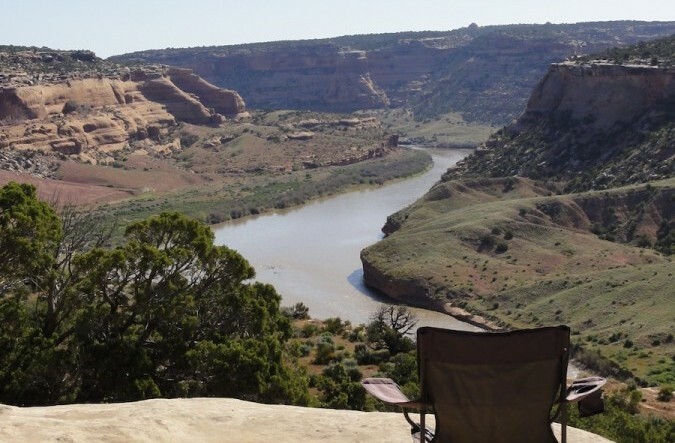 Below are three tips to finding that perfect spot to pitch a tent in your own private part of Colorado. Yes, your phone is awesome and has all the latest bells and whistles, but the $20 laid down at any gas station for a state’s gazetteer will lead to a lifetime of unofficial campsite bliss. Along with detailed county road information, a good gazetteer will color-code public land into usage descriptions, such as national forest, wilderness or Bureau of Land Management areas. Unofficial camping is generally permitted in these areas provided you follow certain regulations, such as how close you camp to water and how long you plan on staying. When on the hunt for an awesome site, open up your gazetteer and follow a long road onto public land far from the maddening crowds- without having to worry about getting a cell phone signal. Literally. Alternative routes can get you almost anywhere in Colorado and are a great bet for finding a spot close to the action, but far from the crowd. Most of the state’s areas of interest can be reached down a road less-traveled, yet still fall inside designated public lands. Smaller, unpaved roads lead into many of the state’s National Forests, where “primitive” or “roadside” camping is allowed almost anywhere, as long as you are at least 100 ft from any road, trail or water source. Official rules can be found at the US Forest Service website. Not surprisingly, most people working at an outdoor adventure store partake in many of the same sports as the gear they sell. Stopping into the local shop and chatting up a salesperson can lead to some amazing insider trading. While they would be crazy to offer up their own super-secret spots to any gaper that walks into the store, a little local knowledge can help guide you to lesser-known sites or areas that are open to unofficial camping.